Rugged, powerful and exceedingly versatile, Colombian Survival's outstanding Bolo Machete opens a vast world of outdoor adventure possibilities that would otherwise be maddeningly out of reach. With its carefully honed 19" blade and rock-solid full tang construction, this all-purpose survival essential can surmount any back country challenge, even in the harshest environmental conditions! The blade is flawlessly cast from resilient stainless steel and features a nonreflective black coating for added stealth and improved corrosion resistance. Bitter serrations along the blade spine add power and versatility; combined, the two distinct edges allow for maximum cutting efficiency and functionality. 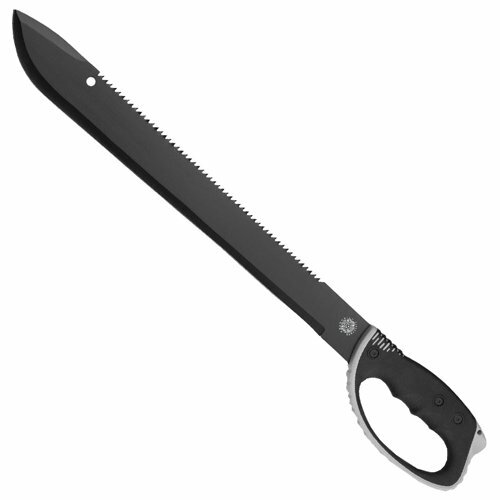 The Bolo Machete is perfect for practically any task - clearing a trail through dense jungle terrain, hacking wood for a lean-to, sawing through thick tree limbs and so much more. The reinforced injection molded handle is every bit as robust as the blade, and its ergonomic contours and unique.